When Sreyroth was a young girl, she believed her life held little opportunity. At best, she would finish high school and become a vegetable seller like her mum or a construction worker like her sister who had dropped out of school in Grade 8. However, when she was 12 years old, she learned about EYC, and her future started to unfold in a new and unimaginable way. Today, at 22, Sreyroth is studying Hospitality and Tourism at Norton University in Phnom Penh with the help of a tuition scholarship from EYC. She dreams of owning a resort where people can come to relax, enjoy time with others, and connect with nature. Sreyroth’s family lived in a slum community near the White Building, the former location of Aziza school where Sreyroth started learning English with EYC at age 12. Unfortunately, the community was forced out, and Sreyroth’s family lost their home due to eviction. The families from the community were resettled 20 kilometers outside the city where there was no school. For many kids, that was the end of their education, but not for Sreyroth. Although it took her 1.5 hours on the back of her dad’s motorbike or in a “tuk-tuk” supplied by EYC, or even longer if she rode a bicycle, Sreyroth went to school each day and was able to continue her involvement with EYC. 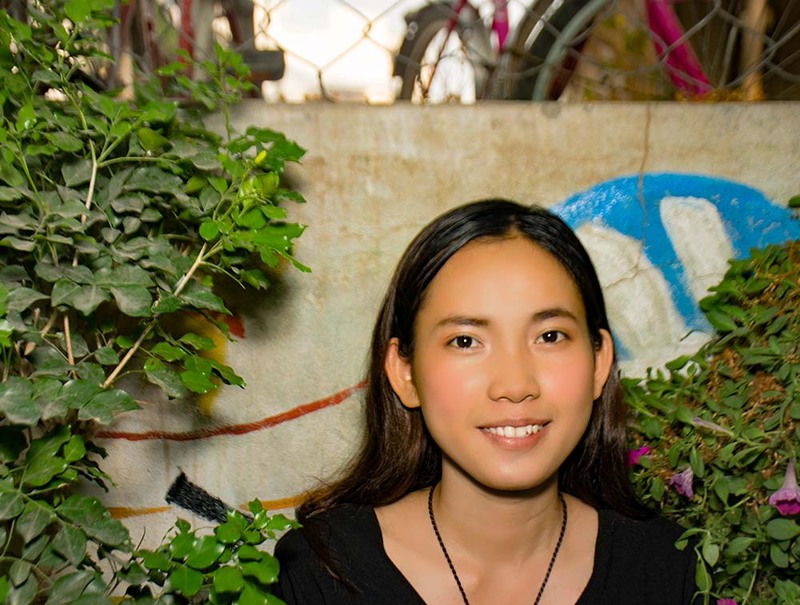 Through EYC, Sreyroth has improved her English proficiency and developed her leadership potential and creative talents through community service, volunteer jobs, and participation in art and music opportunities. Sreyroth has also received EYC scholarships including those for high school math and science; housing and food assistance, and university tuition. When she was 14, EYC provided housing to Sreyroth at Aziza in the White Building so that she would not have to commute 3-4 hours a day. When the White Building was demolished, she lost her second home to eviction, but she now lives at Aziza Thmey where she is the Assistant School Manager. Between this role, her schoolwork, and her job as a receptionist at EYC’s partner NGO, Music Arts School, Sreyroth’s life is hectic. That, however, doesn’t stop her from investing her time in creative and community projects like the “White Band.” This band was formed by a group of Aziza students who, on learning that the White Building was to be demolished, decided to write a song capturing what the White Building community had meant to them. This moving song was performed during EYC’s “Celebrating The Journey” event in November and brought tears to the eyes of all who watched it. Sreyroth’s story is emblematic of the tenacity and resilience of our EYC students. Experiencing eviction twice, only seeing her family sporadically, and surmounting the seemingly endless hurdles in a quest for a better life – Sreyroth is why we do the work we do. There are two words that Sreyroth believes best describe what EYC means to her. They are “Kroursa” which means family and “Sangkhum” which means hope.